When thousands of educators descended on Philadelphia in late June for ISTE 2015, they turned the City of Brotherly Love into the City of Self-Directed Learning. For four days, educators from around the globe had time and space to learn what, how, when, and with whom they wanted. Digital devices were ubiquitous. The backchannel was buzzing. So were animated, face-to-face conversations, which spilled out of conference rooms and into hallways, lounges, and nearby restaurants. For anyone who wonders about the value of personalized learning supported by technology, here was a chance to experience it firsthand. What can we learn from this massive professional learning experience? Here are my top four takeaways from ISTE 2015. Takeaway #1: Global education isn't an American invention. Global Education Day drew an international crowd for an all-day, highly interactive experience before ISTE officially launched. (HT to Lucy Gray @elemenous and Steve Hargadon @stevehargadon for organizing.) By reminding me to put on my global lenses, this was a perfect lead-in to the larger conference. Julie Lindsay (@julielindsay), an international educator from Australia, framed the event by pointing out that global education doesn't start and end in the U.S. It's not only about American students connecting with the wider world (although there's plenty of value in that). Students who develop global competency are able to step outside their own context and understand the perspective of others. They can see the through-line from local action to global consequence. They can communicate across cultures and collaborate to tackle issues that affect us all. One example, suggested by a participant: "Imagine what 10,000 students from around the world could accomplish by tackling climate change together." Opportunities for a deeper dive into global education are coming up in November during the virtual Global Education Conference. Takeaway #2: Teachers are hungry for collaboration. In Hands-On Project Remodel, a session focusing on project-based learning, Mike Gwaltney (@mikegwaltney) and I led a large crowd through series of PBL remodeling exercises. In lightning rounds, teachers worked in small groups remodeling project ideas to emphasize key factors such as authenticity, deeper understanding, and expert connections. Even with limited time for collaboration, participants made real progress. They could see how their focused discussions turned starter ideas for projects into more meaningful learning experiences for students. We captured the before-and-after results in this Google doc, and teachers who weren't able to join us at ISTE can add their own before-and-after PBL ideas to this Google doc. What did participants identify as the biggest barrier to doing more PBL with their students? Lack of time for teacher collaboration. As an idea to try in the coming school year, let's find more opportunities for fast but focused collaboration. Takeaway #3: It's not all about the tools (but we do love them). At an edtech conference, it's no surprise that participants are eager to talk about, and test drive, digital tools. Over many years of attending ISTE, I've noticed a steady shift, with more focus on the learning opportunities afforded by tech tools and less on the latest shiny objects. That doesn't mean we don't love the new stuff. Kahoot! is a good example. Jamie Brooker (@jamiebrooker), chief creative officer for this game-based platform, looked like he was in the middle of a scrum for most of the conference. He stepped away from the crowded Expo Hall long enough to share some insights about how teachers are making use of this platform for learning. Brooker explained, "The rules of the game encourage you to be creative. Within the constraints (of setting up a quiz or survey), what content do you want to focus on?" The goal isn't grading, he insists. "It's about formative assessment. It's about the conversations that happen between questions. It's about engagement." In an early test run, Brooker watched a class in action. One boy was standing on his desk in the back of the room, "leaning in" to play the game. Was the teacher upset? "Not at all. This boy had been the most disruptive student in the school. Now he was focused. It was a magic moment. Our goal is to get more students from the back of the room to the front." Brooker, based in the UK, frequently visits classrooms to see how teachers and students are using the platform. "There are so many creative use cases. A biology teacher developed what she calls a 'blind Kahoot' to introduce content." His favorite use? "When students are in game-creation mode. That involves collaboration, research, critical thinking, student-led discussions. And while students are leading, teachers can be listening and assessing their level of understanding. We don't distinguish between teachers and students -- we're all learners." In a tools-for-learning-focused session, Tools for Every Phase of the Project Cycle, colleague Jane Krauss (@jkrauss) and I asked participants to consider which technologies can support the different phases of project-based learning. By crowdsourcing results, participants created a goldmine of ideas for integrating tech tools -- with an emphasis on specific learning goals -- across the arc of projects. Check out the results and add your suggestions to this Google doc. Takeaway #4: Take time to reflect. 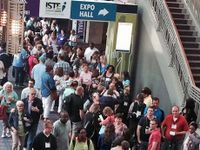 If you were among the thousands of ISTE 2015 attendees, take time to reflect on the experience before the energy and ideas that got you energized in Philly have a chance to dissipate. I remember a smart colleague once describing reflection as "the mind's strongest glue." That's why we ask students to reflect on their learning throughout project-based learning -- both while it's happening and after the final presentation has concluded. ISTE keynoter Josh Stumpenhorst (@stumpteacher) clearly understands the power of reflection. He took time out during his keynote to have listeners tweet out their reflections. His prompts: Who has helped you learn? (Thank them.) What will you do next with what you've learned here? I took his advice and spent a few minutes reflecting with colleague @mikegwaltney. We used Periscope, a video app for Twitter, that I learned about at ISTE. What are your takeaways from ISTE 2015? If you weren't able to attend in person, what did you take away from the tweets, blogs, and other social media tidbits that came out of the conference? What are your next steps? Please share in the comments.